1ST & 2ND SURFACE – THIS IS CONFUSING ME…. 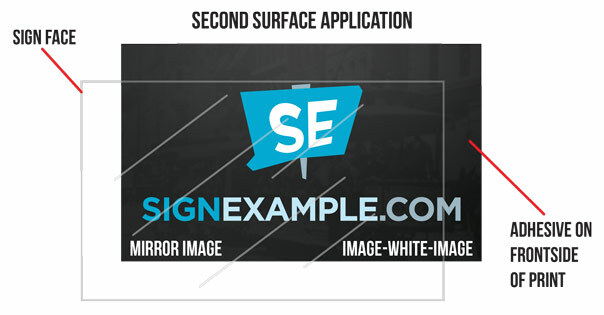 When it comes to 1st and 2nd surface printing or decal application, things can sometimes be a little confusing. This is especially true if you are new to the sign industry or you just aren’t familiar with the terminology. To simplify, we wrote this short post for our lab to help clarify a few things. By the time you are finished, you should have a better understanding of what 1st and 2nd Surfaces are and how they relate to your jobs. 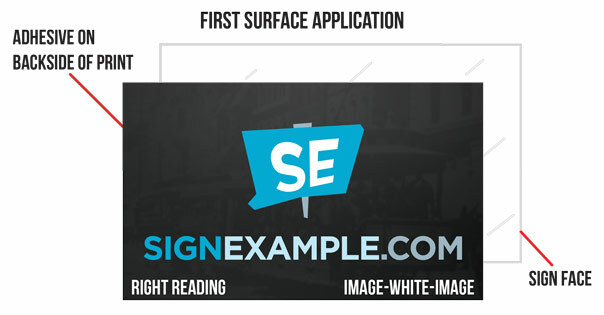 1st Surface refers to the front viewing surface of a substrate. The substrate can be anything from clear Polycarb for a backlit sign, to a glass window in a storefront. There may be differences in the way 1st Surface is used depending on the product you have chosen and the application of that product. For example, you may order a product that calls for printing right reading directly to the 1st Surface of a substrate or applying a right reading printed PSV material to the 1st Surface of a substrate. In either case, the results are the same. The printer produces your graphic right reading directly on the 1st Surface of your substrate or right reading on your PSV to be applied to the 1st Surface of a substrate. The image to the left may help you visualize anything you do not understand about 1st Surface Applications. 2nd Surface is different because we are printing directly to, or applying vinyl, to the opposite side of the 1st Surface. It also means that the printer will produce your graphic “mirror image” because it is being applied to the backside or 2nd surface of a substrate. To explain further, a right reading graphic would not look the same if applied to the back side of a substrate without mirroring the image. 2nd Surface refers to any of our products produced with, or for, a clear substrate. (i.e. backlit sign inserts, static clings, double sided window decals, window perf, etc.) In application, the graphic printed on the Pressure Sensitive Vinyl is reversed and applied on the backside (or second surface) of the substrate for viewing from the front side. The following image may help you visualize anything you do not understand about 2nd Surface Applications. Products that utilize second-surface printing have an advantage of having the clear substrate protect the image from abrasion, chemicals, and/or fading.